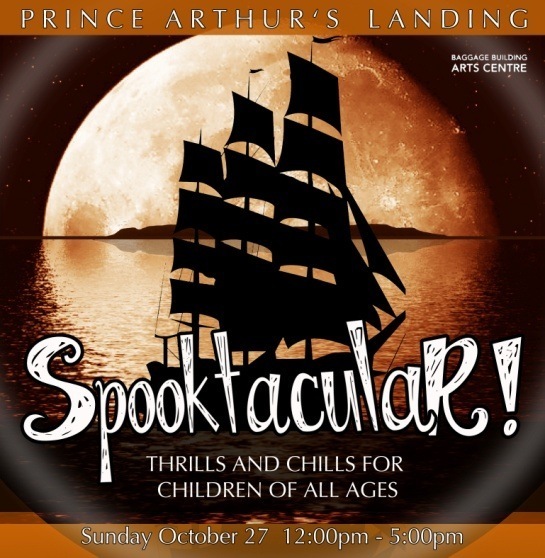 The Baggage Building Arts Centre will be hosting its second annual Halloween Spooktacular event at Prince Arthur’s Landing on Sunday, October 27 from noon-5pm. This family friendly community event is free to the public and includes Halloween craft activities, demos, games, performances, and interactive spooky tours inside and outside. Children (and adults) are invited to wear their Halloween costumes to the event. This year’s Spooktacular theme will be Ghost Ships complete with interactive activities such as the Ghostly Galleon exhibit outside, a Ghost Ship Haunted Walk inside and a special effects green screen so you can see yourself dive for sunken treasure. These and so many other activities will be available at no charge to the public. The Baggage Building Arts Centre, which operates as an artist’s collective/not-for-profit organization, is thankful for the volunteers whose tireless efforts make this an extraordinary community event. Donations are always gratefully accepted.